Hard to believe, but 2009 is half over. Doesn't it seem like we were just battling snow storms and icy roads? It has been cooler here in central New York with lots of thunderstorms this month. I personally like it! OK! I am putting this out into the universe and will work really hard to make it happen. 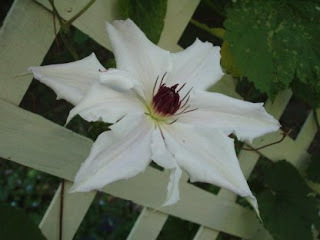 I am going to blog every day of July--yes, you heard it here first. So stay tuned. Sometimes there will be pictures, sometimes not. So hang onto your hats; it will probably be a bumpy ride! Happy Monday morning, everyone! 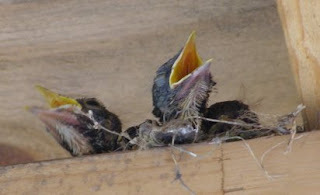 I thought I would start your week with a few pictures of bird babies! Remember the pictures from a few posts ago of the robin babies? Well, here are two of them fully feathered and ready to fly. Just a few minutes after taking this picture, the larger of the two (or the one in the front!) flew from the nest to the porch floor. Mama and Papa Robin had an absolute fit, as he/she landed just a few short feet from me! I went back inside to let things settle down and then the second fledgling made his flying debut as well. A proud day for the Front Porch Robin family. 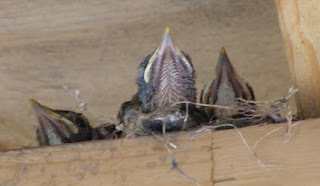 The Back Porch Robins had an equally fine family, although one of the babies did fall from the nest before all its feathers were fully formed. The parents hid him in a bush and I think he successfully matured and flew. Both nests are now empty, as is the phoebe nest in the shed. 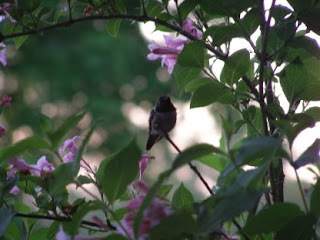 Imagine my surprise to look out my kitchen window and see a baby hummingbird sitting in the wegelia bush! I grabbed my camera and took these shots. It sat so very still while one of the parents flitted around and drank from the pink blossoms. 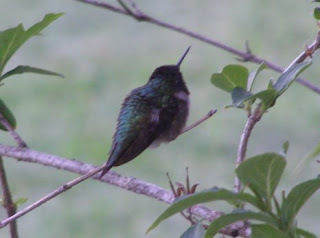 The adult hummers are so sleek but this baby still had a bit more padding! The last picture shows the iridescence of the feathers--so beautiful! Hi ho, hi ho, it's off to class I go. A Powerhouse Applique day where students will learn to handle inside and outside points and curves. It's a repeat of a class I did on Saturday and those students did a wonderful job. Have a great day! Special? Yes, that's you--did you forget? 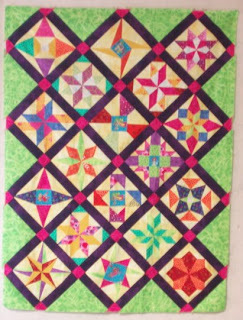 Monthly Bliss 2 composed of 18 seven-inch blocks set on point. And Monthly Bliss 1 composed of 25 seven-inch blocks, also set on point. What a change in fabrics! From the 30s reproductions in year one to brights in year 2. And her hexagon piece is a more subtle piece with Christmas prints. 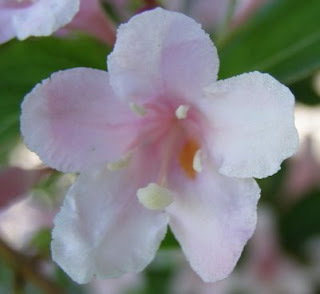 Below are two pictures of my wegelia bush. It is in front of my bow window in the kitchen. 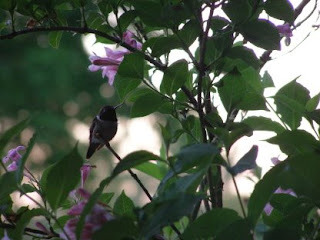 Last night I was able to get pictures of a baby hummingbird perched in the bush. I'll share those in the next post. This bush is a major draw for the hummers--and I quite often find them resting among the blossoms. It's an easy way to draw birds without having the hassle of filling feeders. I also have butterfly bushes and fushias. Plus hollyhocks. We've had two wonderful thunderstorms today. I always love the lightning and thunder. Lynnie hides under the table, but I want to be out on the porches watching the action. It's been several years since we've had what I think of as "real" thunderstorms. Not just heat lightning and a bit of a rumble. These storms were the light up the sky and rattle the windows types. Good night or good morning, dear blog readers. Did you remember to tell yourself how special you are today? Stand in front of a mirror and look yourself right in the eye when you say it--then stand tall and smile and start the day on a high note. Repeat as necessary throughout the day for a special lift. 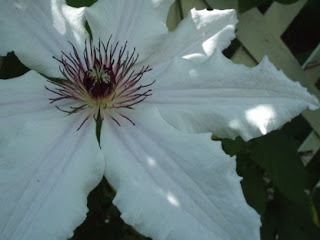 It's been rainy and gloomy here for the past few days, so I thought I would post pictures of my mom's clematis blooms to boost everyone's spirits! 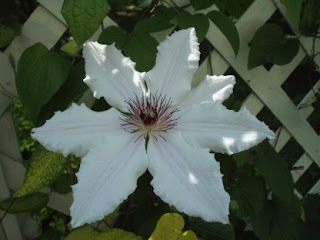 These blooms are over 8 inches across and so snowy white. 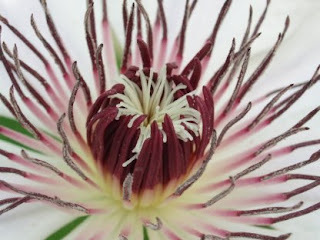 I especially like the close-up of the center--looks almost scary! 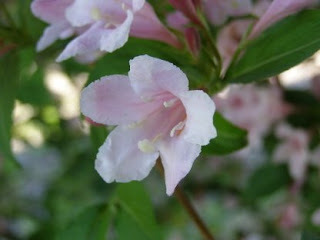 A short post today to let you know I am still out here! I have actually been quilting a small piece and have it almost done! Have actually had some quality time off this month--I'm trying not to like it too much because starting next Saturday it all hits the fan again. 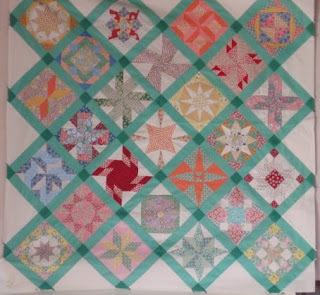 Next post I have quilt pictures from students and some other things to amuse you! Happy Father's Day to anyone who's a father and Happy Sunday to everyone else! Take time to do something special for yourself today and spend some time with your dad if you are still lucky enough to have one around. 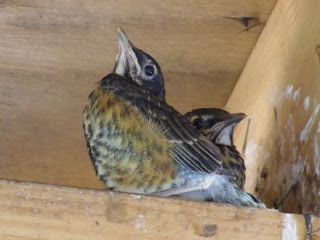 The robin babies on the front porch hatched a few days ago and I was able to get some pics of them. I think there are five, although they are so close together in the nest that it is hard to tell! When I was taking the pictures, the mom had flown into a tree and was nattering at the babies, telling them to "Shut up, keep your heads down, and maybe the crazy lady will leave more quickly!" Please remember that my camera has a 10X zoom, so I am nowhere close to these darlings! These two look like they are singing! Had a wonderful hand quilting class yesterday--all the students did a great job and learned to quilt without a hoop or frame and without poking their underneath fingers! Thanks for joining me, ladies! Today is the second session of my basic hand applique class. Students have a small wallhanging started and have learned to handle inner and outer curves, inner and outer points and bias stems. Does anyone have sheep for rent? I didn't mow last week because it was hot and dry--now we've had several days of rain and the lawn looks like hayfield (which is really what it is). I may have to bale it! Forget mulching! Raking? Fugetaboutit! Happy Sunday, everyone. Hope you do something fun with family and friends. And say an extra prayer for our Armed Forces and for America. Thursday was a special day. First, I had an excellent class--seven wonderful ladies learned to rotary cut, precision machine piece and press while working on Goose in the Pond blocks. A wide range of skill levels, but each student brought a willingness to learn. One student had many "aha" moments--where she learned why some of her previous projects did not go together as well as they might have. Then, it was off to dinner with my bestest best friend, Cindy. We were actually celebrating her birthday--the one that was officially August 2008! We never have been timely with celebrating anything--preferring to draw out the suspense. We have also decreed that we do not officially turn another year older until we celebrate together. Hey, it works for us! We had a great time--it is always so far between visits--where does the time go? To cap off this banner day, when I got home there was a sundog! Usually by the time I can get my camera out it has disappeared, but this time I was able to document it! Sorry the pictures are separated, but here is the detail shot and at the end of the blog is the wide angle shot. 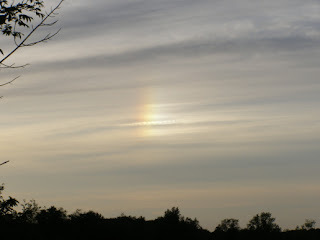 Sundogs are usually a sign of a change in weather--and those of us who realize we need it are hoping it means rain. We are very dry and what sprinkles we are getting are definitely not enough. I had promised in the last post to share with you my auction finds. I had to wait through the entire auction for these pieces to come up. I had bought nothing else so I was determined to win. And, I had asked for my lucky number - 13 - so I was sure they would be mine! 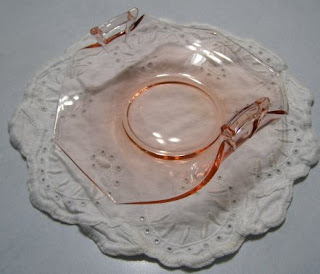 Another woman mistakenly thought these pink beauties would ultimately be hers. She was wrong! Even the auctioneer said that I was very determined! The first picture shows the tiny little whatever it is!!?? It is 2.25 inches high and 4 inches from handle tip to handle tip. It is perfect. Although they do not go together this dish was sold with the whatever it is. 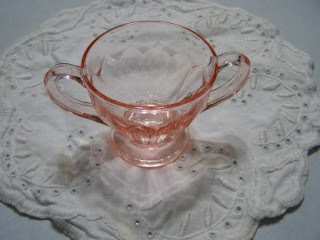 It too is pristine and a slightly darker shade of pink. 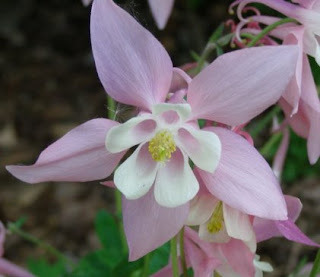 I'm not sure if Anne at Bunny Hill reads my blog, but I bet she will be "pink" with envy if she sees these--she loves all things pink! I was thrilled to come away the winner. Okay, guess that's about it for this time. 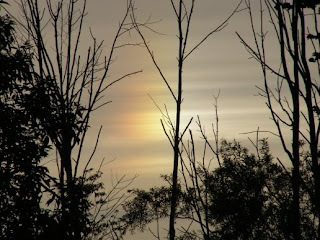 I'll leave you with the last picture of the sundog. Yes, Thursday was a wonderful day. And, come to think of it, the auction took place LAST Thursday! What a rush! Remember to smile randomly--it makes people wonder what you are up to! Hugs and good night and sweet dreams of whatever makes your heart sing! June is here. A month for weddings, graduations, Father's Day and probably many more celebrations. The lilacs are on their last legs, but the poppies are unfurling their beautiful blossoms as we speak. The sky has been so spectacular the last few weeks. 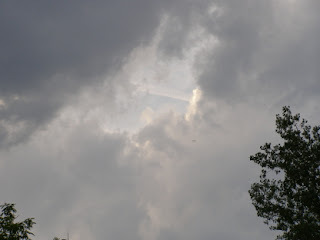 We seem to alternate between sunny, cloudless skies and wind-tossed, stormy, cloudy skies. I know this is not a popular view, but I really enjoy the cloudy, chillier days. It's more pleasant to work outside without sweating profusely and swatting all manner of insects. Or I can choose to huddle up in my sewing rooms with my audio books and Lynnie sleeping at my feet. When it gets hot, the only choice for me is to turn the air conditioner on the coldest setting and sit in front of it! At least it keeps me quilting! 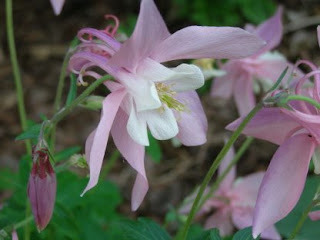 My columbine was especially pretty this year. Here are a couple pics for you to enjoy. I'm busy designing and stitching new samples for the fall--yes, I said fall, even though it isn't officially summer yet. Everything takes longer than I expect, but part of that is because I am trying to find a better balance between work and play. For the past five years (and even before that), I have concentrated on work. But all work and no play makes Sharon a very dull and uninteresting girl. Unfortunately, I seem to swing between all work and all play--I never have been a half-way person about anything. I am reading Robbi Joy Eklow's new book, The Goddess of the Last Minute. It is absolutely divine! I have laughed over some of the stuff, found great tips for storage and new reading materials to search for. Do yourself a favor and get a copy.